Looks Good from the Back: We Discuss: Weekly Purchases. A: Blog Science question! Did you buy anything last week? M: I did! I was all excited to show you my cute H&M leopard dress that I’m wearing today to lure you to love them and it’s not on the website UGH. A: What the hell, H&M. A: Can you take a selfie? I need to seeeee. A: Okay, that is ADORABLE. A: I would like to wear boots one day. M: But yes it’s a VERY cute dress, I may have to dry clean it because it cannot get even one inch shorter. M: I decided I could do booties with short sleeves/short dress and not die. A: I am not there yet and even though I love the warm weather I’m getting impatient. A: Have you worn your Anthro jacket yet? M: I haven’t! It’s too damn hot! But supposedly fall is coming all at once on Thursday. A: We are apparently getting tropical storm remnants on Thursday. Yay. M: Oh and I got another H&M dress but I need to have the waist taken in. A: I want to see the other dress, pls. A: PS. I also bought something. M: What did you get. 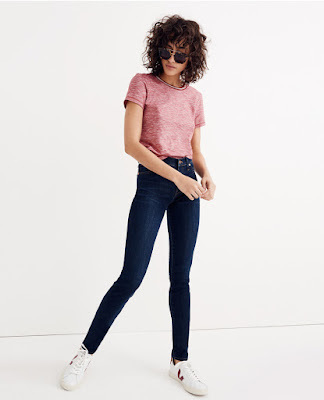 A: I got amazing Tencel skinny jeans from Madewell. A: I actually found a jeans hole in my closet! A: Hear me out. I did not have a normal pair of skinny blue jeans that I could wear to work. 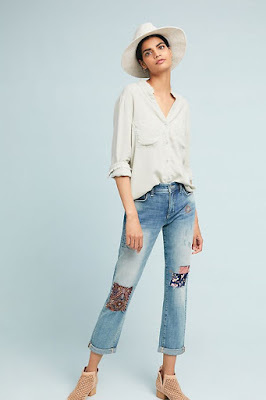 M: Oh I’m laughing because I bought Emergency Jeans at Anthropologie when I was in NY and they are...different. M: But I love them. M: Wait you can wear jeans to work now? A: Only on Friday or when I can sort-of disguise them as regular pants. A: Tell me about your Anthro jeans. M: You will hate them. M: Or at least not approve. A: I don’t hate them! Not my style but VERY cute. M: They were a desperation purchase in NY because I left my jeans on the drying rack at home and I wanted something different so I felt justified. A: I'm not sure how you could have NOT bought them. M: The leopard dress is nowhere to be found and I can’t find the other one EITHER jeez. 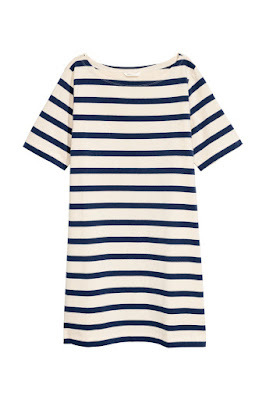 M: However how cute would this be with an olive jacket and sneakers?? A: Ugh, I love that. 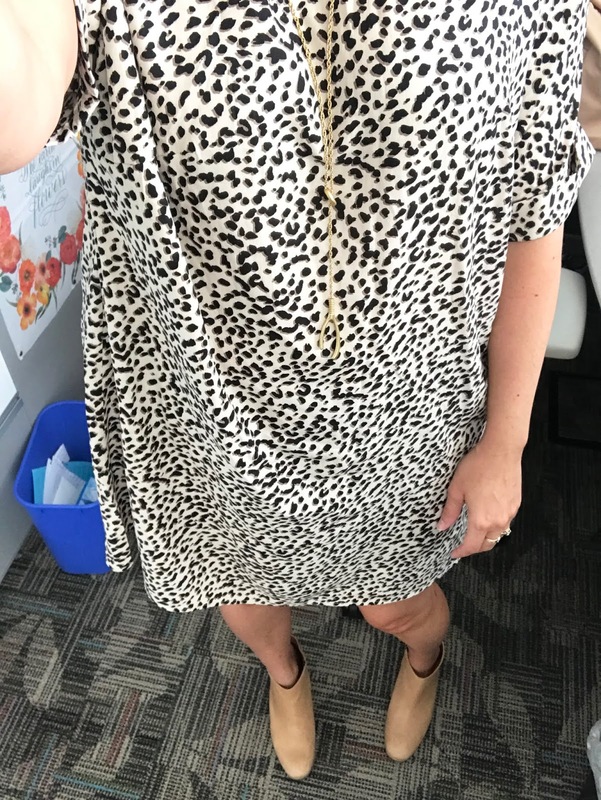 A: 114 leopard items on H&M's website and your dress is not one of them? M: The mint green dress in the second pic is the other one I bought. M: It runs huge, I bought an 8 and still need the waist taken in. M: But the fabric is very pretty. A: I never find anything at H&M. M: Officially giving up on finding the leopard dress. M: It’s very hit or miss but when it’s a hit it’s so good. A: It’s very Liberty of London meets Florence Welch! M: Which I’m verrrry into. 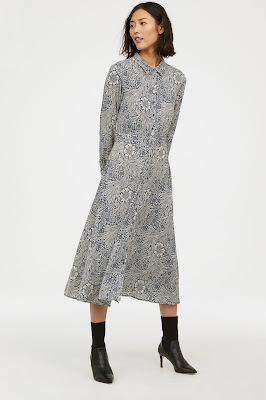 M: I just want to wear sack dresses and booties forever.